Shirts With Random Triangles: Alabama lands its first commitment for 2016 from DT prospect Benito Jones. 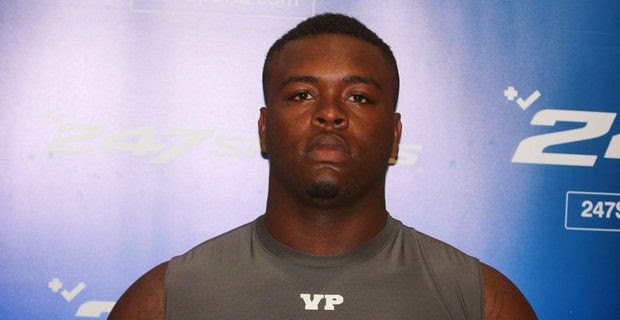 Alabama lands its first commitment for 2016 from DT prospect Benito Jones. Alabama isn't quite done with its 2015 recruiting class yet. That isn't stopping the Crimson Tide from looking ahead to 2016. Waynesboro, Ms. rising junior defensive tackle Benito Jones has become the first prospect to commit to 'Bama's 2016 recruiting class. Jones is rated as a four-star defensive tackle. He is the ranked tenth among DT prospects for 2016. He is the ranked third among 2016 prospects in the state of Mississippi, and is ranked 98th among all 2016 prospects in the U.S.
Jones is ranked at 120 in the ESPN Jr300. Jones attends Wayne County High School on Waynesboro, Ms. He stands 6'2", and weighs 260 pounds.